It has been roughly a week now since our return to La Paz and life in a marina. And it has been several weeks since the last posting. To our way of thinking there has not been anything of note to write about but that may be explained by our view that this life we are leading is “normal”. At least, it seems perfectly normal to us. We did get to enjoy something in San Evaristo that was a bit out of the ordinary though. Judy and I had gone ashore just to walk about the little village (about 20 families) and investigate the minimarket that was reported to be there. As we secured our dinghy on the b each we were joined by a panga carrying a family from the island of San Jose, a few miles away. The market at San Evaristo. No, it doesn’t look like much but it was surprisingly well stocked. You’ve got how many goats in there!? 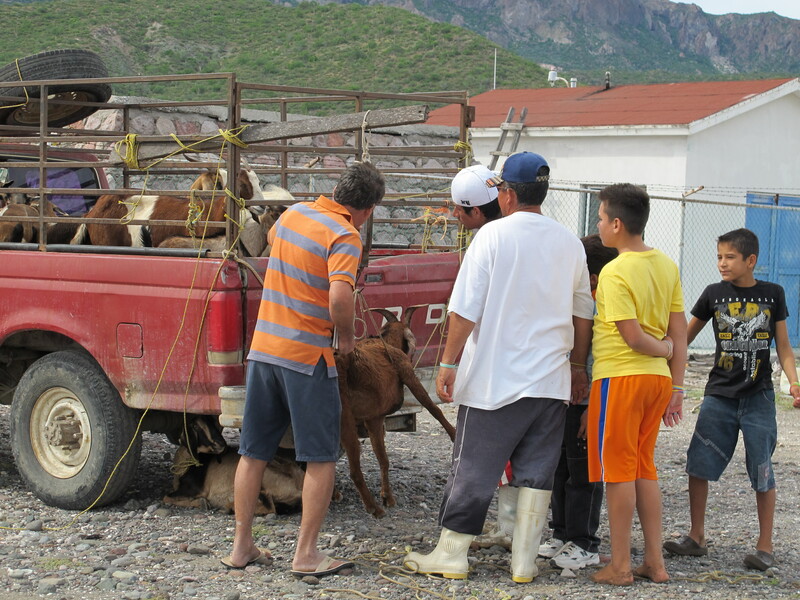 Along with the family of 6 (Granddad, Dad, Mom, and 3 teenage children) they had packed 27 goats into the boat. 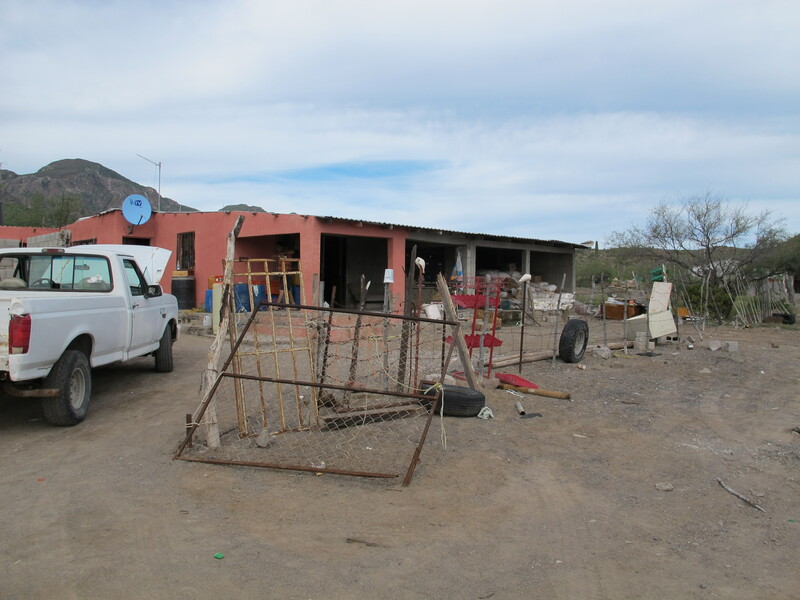 It seems that it was “take the goats to market day” and San Evaristo boasts road access to La Paz – roughly a 3 hour drive over a poorly graded and often washed out dirt road. None of the family, nor the fellow with the scales and the pickup truck, spoke any English but Alba (Mom) in particular, was quite friendly. And so we found ourselves smack in the middle of a goat wrestling. 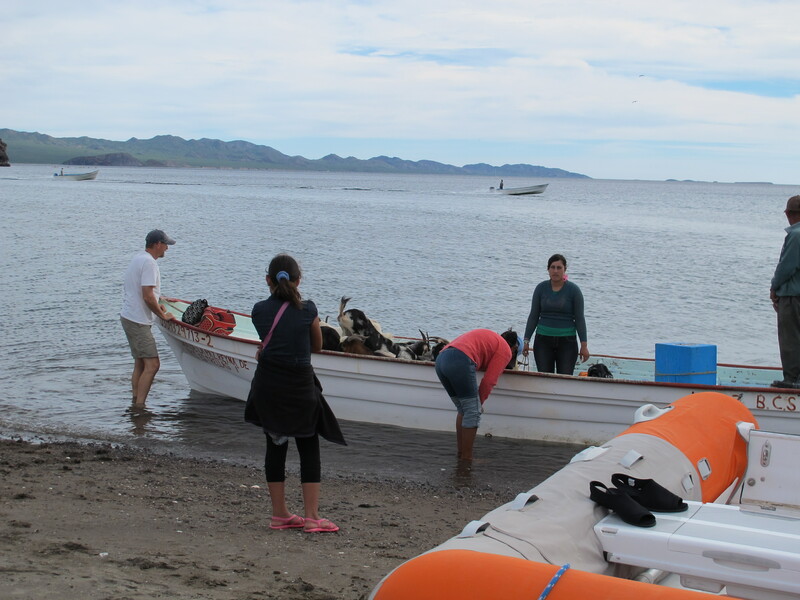 With the panga pulled up sideways at the beach the goats were wrestled one by one, over the gunwales and onto the beach then led (or dragged for the more stubborn ones) some 40 yards or so to the waiting truck. There they were placed in a sling and suspended from the scales for a weight estimate before being packed into the bed of this pickup. Many of the goats had other ideas about what they should be doing and applied themselves to varying degrees of resistance – not all of them passive. What a hoot. Several kids from the village became involved along the way and, in the end, it was quite a spectacle. 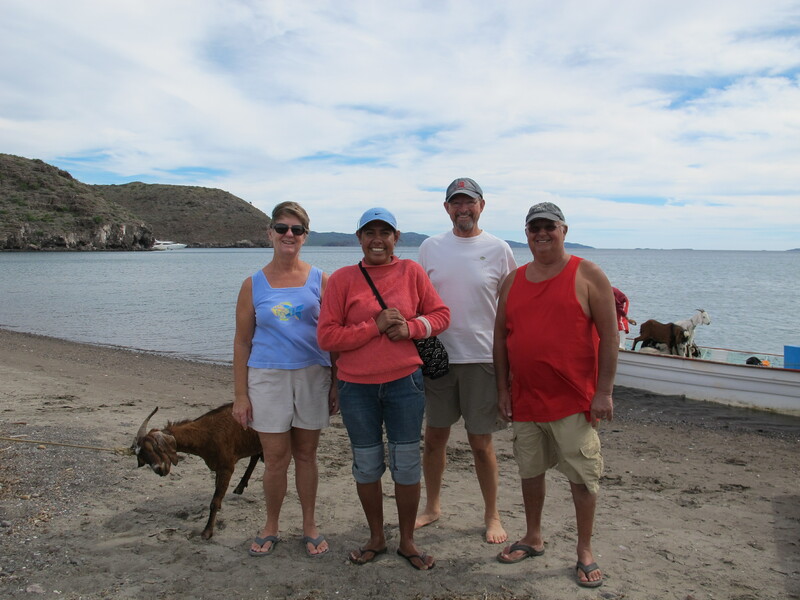 We learned that this family, along with a couple of others, live on the east side of Isla San Jose in a village even smaller than San Evaristo. There they fish, raise goats and a few cows and generally live a simple but very full life. Their only complaint was the difficulty of schooling the children as there were not enough children in their village to attract or keep a teacher. But they were happy and felt their life there was rich and full. They were also very welcoming, taking pains to describe how to locate their village and inviting us to anchor there and come for a visit. They would like very much to show us their home and to cook for us. Isn’t that great! Unfortunately, where they are on Isla San Jose is not very well suited as an anchorage except in very mild sea and wind conditions so we are not sure that we will ever be able to take them up on their invitation. But, who knows, maybe one day. We left San Evaristo for Caleta Partida, a very well protected anchorage between Isla Partida and Espiritu Santos only a few hours north of La Paz. We’ve been here several times before and enjoyed two calm nights there before moving on to Bahia Falsa for our last night out. Bahia Falsa is just outside the channel leading into La Paz and is only an hour and a half motor away from the marina. It was our first stay there and we were pleasantly surprised at how nice it was. It is close enough to La Paz to have good cell phone coverage but lies along the highway between the city and the ferry terminal so we had the noise of highway traffic for the first time in a long while. It’s odd just how obnoxious that is when you are used to being away from it. Friends had buddy boated with us from San Evaristo to Caleta Partida then on to Bahia Falsa where we were joined there by two other boats that we knew, all of us returning to one or another of the marinas in La Paz. Naturally a small wake was held that evening to mourn the end of our cruising season. Life since arriving at the marina has been a whirlwind of activity. Cleaning the boat, attacking projects that had been put off until now, new restaurants to investigate and old favorites to return to. There is much activity in the marinas and in the town as boats migrating south from the Pacific coast of North America and from the Sea of Cortez are all arriving while others headed for the mainland and points South are making themselves ready to go. There is also quite a bit of traffic in town from the recently completed SCORE Baja 1000 off road race. On a daily basis we run into old friends from last “season”, meet others who have only just arrived or say goodbye to others. Fall is in the air; welcome parties have been staged; Mexico’s Revolution Day celebrations disrupted life for the better part of a week with parades and business closures; Thanksgiving is almost upon us and there are potlucks to sign up for or restaurants reservations to be made; and, this weekend there is a huge fund raising event put on by the cruisers to benefit a local charity. It is not quite correct to describe the atmosphere as circus like but that would not be very far off. We (mostly) enjoy all this and are happy that we have the car here now. But, we truly miss that time we spent at anchor and are already looking forward to the spring when we will once again trade these dock lines for an anchor chain. It was all pretty good fun, Amy. Unless you were one of the goats, that is. As you might expect, some were cute and some were stubborn and ornery but none of them seemed to be having any fun. You guys will be at anchor again soon – like us. Enjoy the marina life – just slow down a bit. Happy Thanksgiving! Happy Thanksgiving to you guys, too! We ARE working on the slowing down thing but there’s still room for improvement and some of our problems with that comes back to how we are hardwired in the first place. Not sure how much one can really do about that. You can critique us when you are here in January – we are sooo looking forward to seeing you here then!